Our students often say that La Salle becomes their second home. What better way to help make the transition to college easier than living with other first-year students with similar interests, hobbies, and lifestyles? Living Learning Communities (LLC) are on-campus residential communities designed to enhance and enrich student experience by strengthening academic success, cultivating a supportive environment, and providing an even greater sense of community through unique opportunities for faculty and student interaction around specific interests. 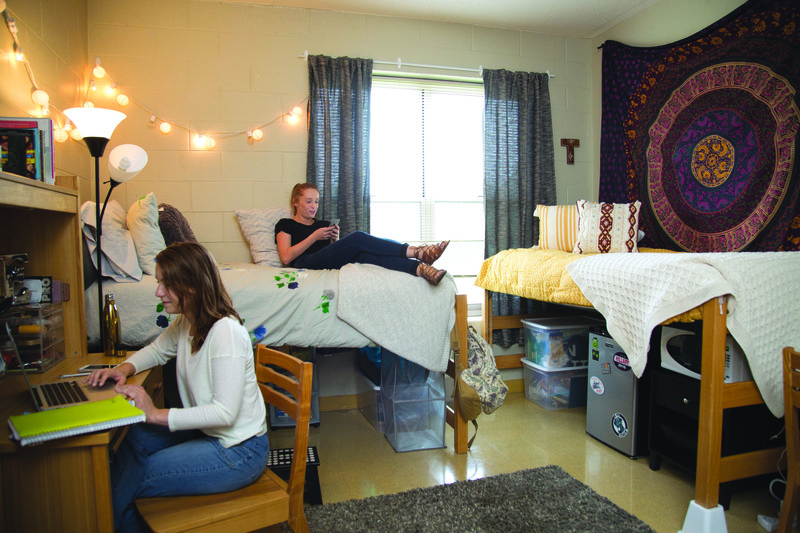 If you choose one of our four LLCs, you will be part of a tight-knit community living together in an LLC-specific area of one of our residential halls. You’ll have the opportunity to interact with each other and with student, staff, and faculty mentors, while attending events, speakers, and programs specific to your LLC. Students will work together with the guidance of their Resident Adviser (RA) and other advisers to shape their learning experiences and take responsibility for their shared community. Offers a welcoming atmosphere for students who are interested in expressing and exploring their creativity. Students drawn to this LLC may be more creative or art-focused— seeing plays or movies, making or listening to music, writing or reading, or viewing or creating visual art. This LLC will provide students with distinctive opportunities to explore the rich cultural and historic City of Philadelphia. Latin for “sign of faith,” Signum Fidei provides students the opportunity to meet and live with students with similar values. Students will explore the Lasallian concepts of faith, service, and community, while reflecting what those concepts mean to them personally and discovering their life’s passion. If you’re interested in giving back to the community and making a difference, Signum Fidei will provide students with countless service opportunities—locally and through travel. Is designed to foster all seven aspects of wellness (social, mental/emotional, physical, environmental, occupational, intellectual, spiritual, and financial) through social activities, as well as workshops and awareness campaigns on many of the topics relevant to your life—all in a fun and dynamic setting. By becoming aware of the factors that influence wellness, you can make positive choices that contribute to your quality of life. You’ll have the chance to make friends and interact with people who share your goal of living a well-balanced life and are interested in wellness, health, and fitness. Is designed to generate camaraderie among students who are interested in world cultures from a variety of perspectives. Students will create a vibrant community centered on exploring and sharing global perspectives. Taking full advantage of our culturally-rich and diverse city of Philadelphia, students will have the opportunity to discuss and explore other cultures through experiences such as film, cuisine, cultural festivals, travel, languages, and art.